So much yarn, so little time. 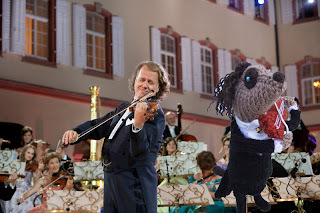 : Andre Rieu - my aunt's musical hero! My aunt has an ever-growing collection of DVDs featuring charismatic Dutch Violinist Andre Rieu and his orchestra. She asked me to look up the prices of tickets to his concerts...and I was staggered to see some seats are ONE THOUSAND POUNDS! But I did the next best thing... meerkatted him! Funny ;-) The hair is sooo Dutch!!!! I don't think I can tell which is which. I think you've made him more handsome than the original!